Wooden blinds is not very popular in high rise residential building because of some restrictions in light-only colors such as white or beige. Luckily, wooden blinds also comes in light colors so it shouldn’t be a problem if you are in a condo unit. Our premium genuine wood blinds really shine in bungalow houses though, usually found in subdivisions, that don’t have any restrictions on what type or color of window coverings you’ll be having in your house, after all it’s your house. Everyone knows that wood blinds is one of the classiest and luxurious blinds nowadays and using this as your window cover can easily make your room look more elegant and stylish. Wood blinds have been around for more than a century but still it’s one of the trendy blinds as of now. Many have said that classics will never go out of style just like wood blinds. 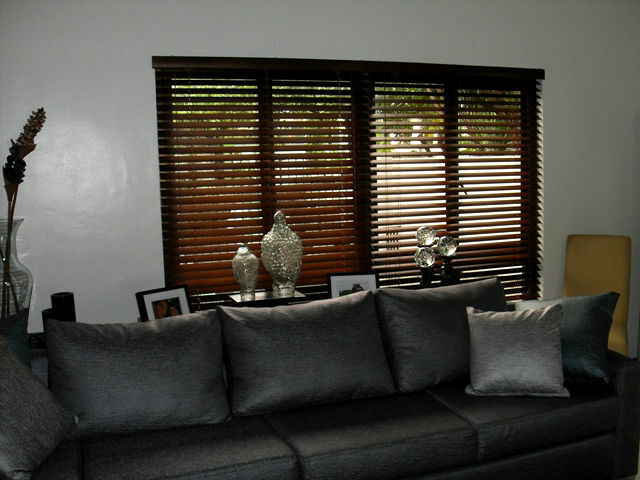 One of our clients in Taguig City, Metro Manila, Philippines happens to love wood crafts and opted for wood blinds as her window cover. Since she likes to make a difference and adores classic beauty, she make a little twist by combining and alternating different colors of wood blinds in one panel. Through blending light and dark color wood blinds, she transformed a normal blinds into an extraordinary and elegant style. Wood blinds is stylish as it is, but by mixing it with different colors will make it more interesting to look and more noticeable. DS Window & Walls offers different colors of wood blinds and you can mix them without additional charges. For further inquiries, please call us at (02) 893-1373/ (02) 403-3262 / 0916-311-3909 or email us at inquiry@dswindows.com. You can personally see our sample products and swatches at 4th Level Waltermart, Makati City, 3rd Level Robinsons Metro East, Pasig City and 2nd Level Pacific Mall, Lucena City. One of our clients in Pampanga, Philippines has a Chinese theme for her dining room that she copied from one of her friends in China. She wanted to make the center piece of her dining room some of her paintings and pictures that she brought from China that’s why she rearranged and replaced her other furniture just to match with her design. Since her window is huge and can really catch anyone’s attention, she decided to change her window cover that will go with the motif of her dining room and that is with the use of Wood Blinds. Our client selected wood blinds with natural color. 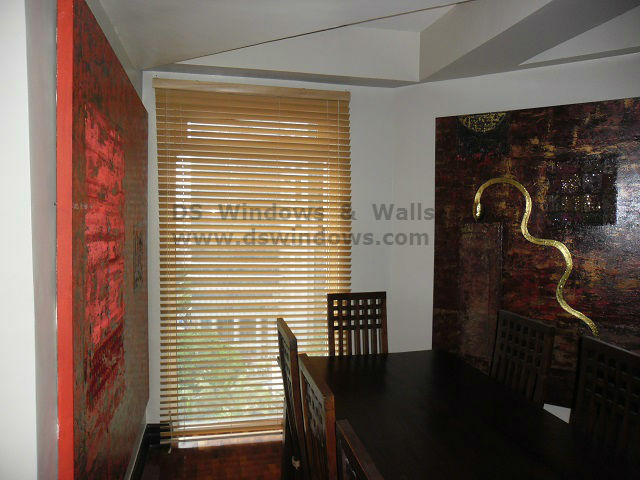 Through her wood blinds, it helps emphasize the theme of her dining room and it also complement the beauty of her home. Wood blinds also create an elegant and chic look that will match to any kind of decor and home motif. Wood blinds neutral color is also a smart choice because any theme can match with it. For someone who are used to change home design occasionally, it’s better to do with something neutral color. 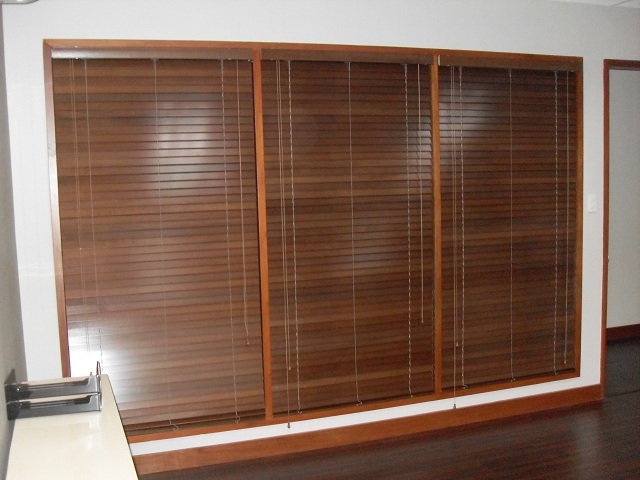 In DS Windows & Walls, we offer wood blinds with different finishes like white, natural, cherry, etc. For you to see our other products, visit our website http://www.dswindows.com/ or visit our showrooms at 4th Level Waltermart, Makati City, 3rd Level Robinsons Metro East, Pasig City and 2nd Level Pacific Mall, Lucena City. For any inquiries, please call us at (02) 893-1379 / (02) 403-3262 / 0916-311-3909 or email us at inquiry@dswindows.com. The destruction of our nature is one of the biggest problems we are facing right now. Since we cannot see and feel it immediately, we do not fear and think about it that much. These past few years, we are starting to feel the result of what we did to our polluted and damaged Mother Earth. The massive changes in our temperature and the unpredictable weather are extremely and constantly happening. Global warming is the main cause of almost all environmental destruction like floods, extreme heat from the sun, soil erosion, etc. The pollution in air like car smoke, factory smoke and burn plastic are some of those things that damage the ozone layer, resulting global warming. Using materials that are not made of plastic can help save our planet. Plastic cannot be decomposed and when it burns, it produces carbon monoxide and dioxide that are harmful for our planet and for our health. Here in the Philippines, Alabang City, Makati City and various cities in Manila already implemented the “NO PLASTIC POLICY” and preferred paper bags, which are biodegradable, to help Mother Earth and for the benefit of future children. 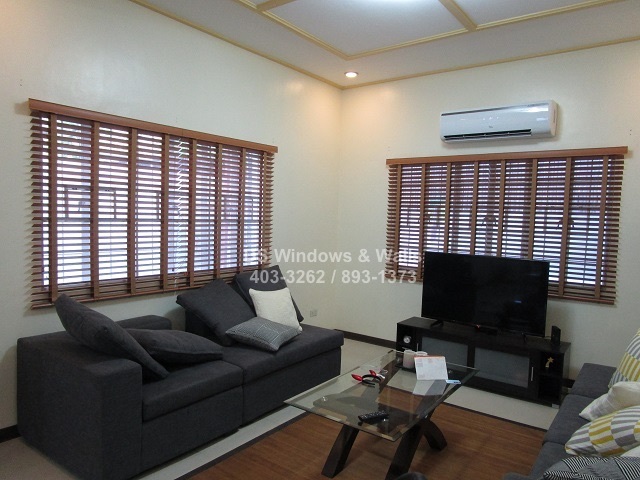 One of our clients in Pasay City decided to use Wood Blinds as her window treatment in her home. She is very active in every campaign against global warming and saving nature. Using real wood as window cover can also help save the earth since it is a natural material. Wood Blinds will surely give you a great look for a home and functional window blinds while helping planet at the same time. 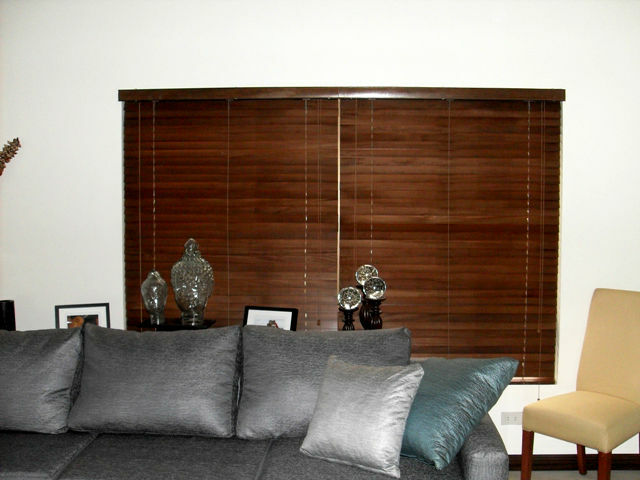 To match with her interior, she selected Wood Blinds: Walnut Color, creating an elegant look in her living room. 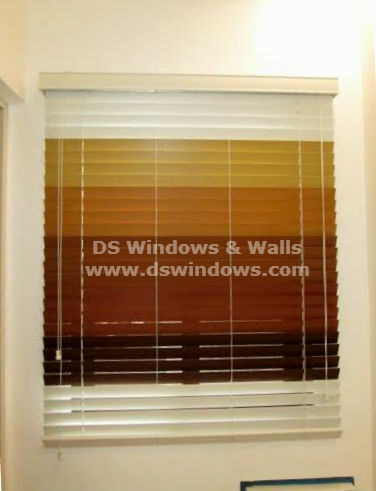 DS Windows & Walls Interior Supply can give you a high quality window blinds that will provide all your needs and wants. Our window blinds are all safe for your health and are very affordable and durable. 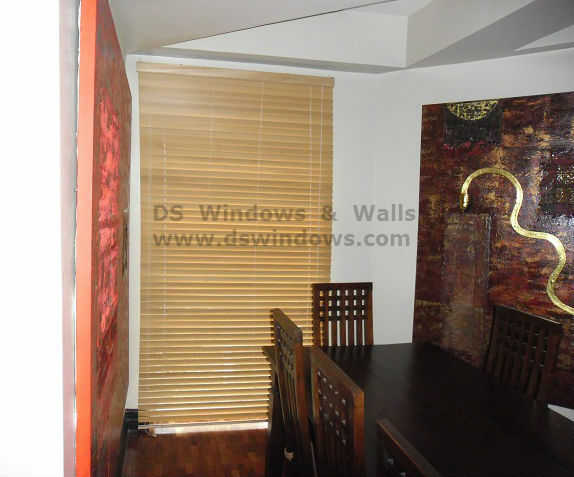 For more details about the products, you can visit our website at http://www.dswindows.com. For inquiries and free quotation, you can email us at inquiry@dswindows.com. You can also call us at (02) 893-1373 / (02) 403-3262 / 0916-311-3909. You can also visit our showrooms at 4th Level Waltermart, Makati City, 3rd Level Robinsons Metro East, Pasig City and 2nd Level Pacific Mall, Lucena City. For Mindanao area, you may visit Paneo Furniture at Bagarinao Complex Cor. Quezon and Zamora St. Dipolog City, Zamboanga Del Norte, Mindanao. You may also email at paneofurniture@gmail.com or call / text at 0939-418-8355 / 0999-991-8748. Many people are discovering the new way to decorate their home with modern and advanced techniques like the window coverings. Some of us are still fond to have traditional motif to transform a boring design to an exciting one. For a traditional motif house, Wooden Blinds will perfectly fit for this. Its natural colors and richness will surely match to your furniture and other home decor. We do have basswood and pinewood finishes which consist of different colors ranging from the darkest to lightest color of wood blinds. 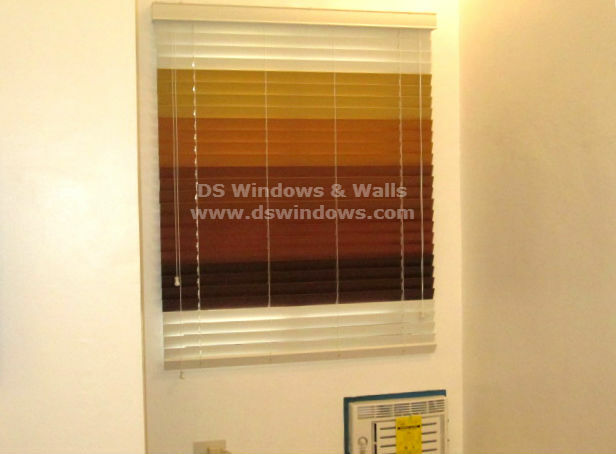 In DS Windows & Walls, we supply and install different kind of blinds in an affordable and competitive cost. All of the designs of our wooden blinds are attractive as they all have the natural glow and beauty of wood. It can bring back the nature into your home and a nature-friendly way to enhance your interior design. The perfect method to clean the wooden blinds is that you can use a cloth or clean towel then wipe along each slat until the woods are perfectly clean, just make sure you do not use much of water on the cloth it will might warp the wood. 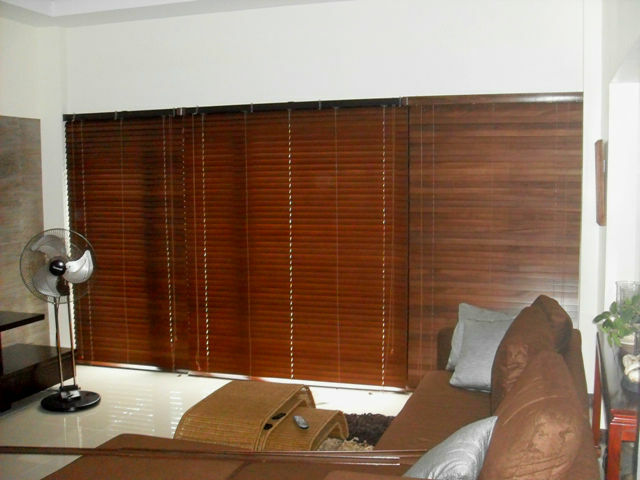 One of our clients from Pasig City, Philippines opted for a Basswood Ebony color of wooden blinds due to its classy look. 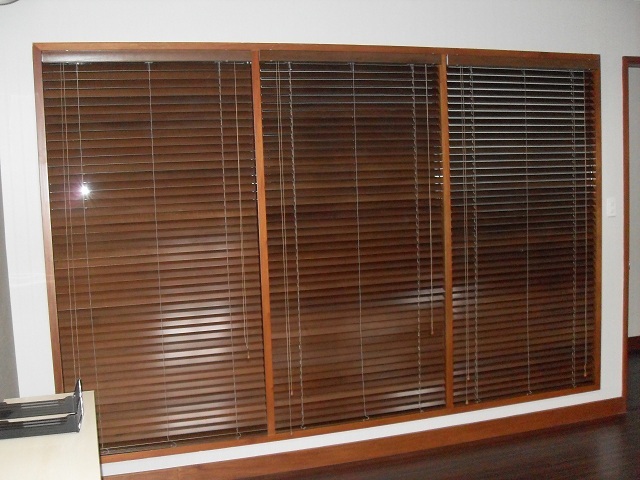 You can also have Fauxwood Blinds as an alternative to Wood Blinds. For more inquiries just text/call us at 0916- 311-3909 / (02) 893-1373 / (02) 403-32-62 or email us at inquiry@dswindows.com. Showrooms are located at 4/f Waltermart Center Makati and 3/f Robinsons Metro East Pasig.